The background to this post, and the OTN Appreciation Day can be seen at Oracle-Base. 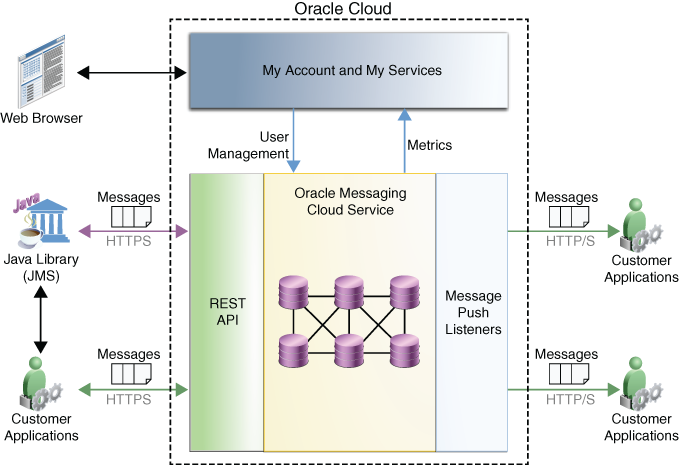 Oracle Messaging Cloud Service (OMCS) is I think an overlooked gem of Oracle iPaaS portfolio. I say this as it offers a JMS 1.1 compliant Java library but at the same time provides a means through which integration through REST APIs can be performed. This means it is possible to pretty transparently connect legacy JMS based integrations with new REST based products. The magic sauce (and therefore my favourite feature) is the concept of the Push Listener. Through the REST API it is possible to register a REST URL as a target for queues and topics to have messages sent to. Once registered when a message appears on the queue or topic it will get passed on as a REST call. Whilst is is possible to do with with a little bit of Java code. the Push Listener simplifies the job to a REST call with a bit of XML configuration. There is one small challenge that makes the integration completely transparent to the recipient of the PushListener today, and that is it currently demands that authentication process take place on initial contact. This is not a complicated or challenging thing to address, but does require a tiny bit of code to address.